Here I shall show an easy recipe for making chirashizushi. This is a 10-minute chirashizushi recipe invented by Japan’s most famous cooking researcher, Katsuyo Kobayashi (1937-2014). The rice in chirashizushi is generally made by mixing in some flavoring, such as rice vinegar. However, this chirashizushi is made simply by pouring the flavoring over the rice, making it much easier to prepare. As long as you have some freshly-cooked rice, you can make this dish in just 10 minutes. This is a recipe for making chirashizushi in 10 minutes. 1* Please see here for how to cook Japanese rice. 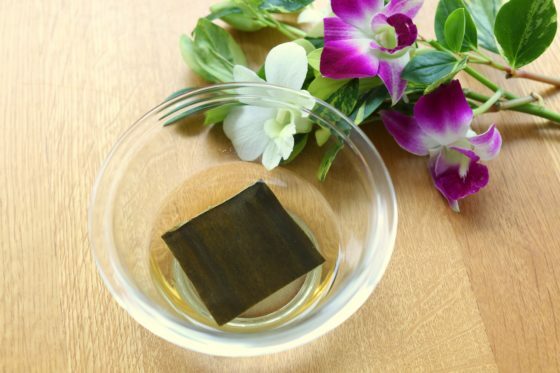 2* If you do not have sushi vinegar, you can substitute it for rice vinegar. Please see the explanation below. 3* If you do not have rice vinegar, you can substitute it for any other type of vinegar that does not have a strong aroma. Serve a flat layer of rice on the plate. 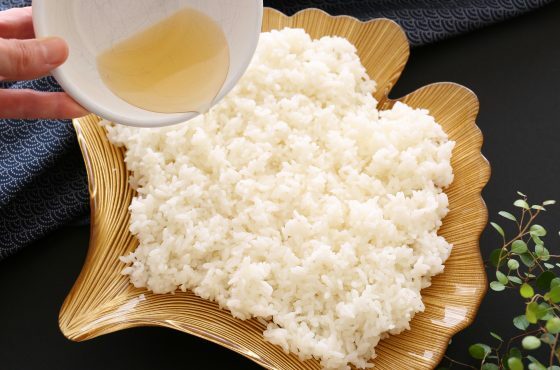 Make the vinegar mixture by mixing the sushi vinegar and rice vinegar, and pour half of it over the rice. Scatter the toppings over the rice, and then pour over the remaining vinegar mixture. Your chirashizushi is now ready. Serve the freshly-cooked rice on a plate, using a spatula to spread it out evenly. Next, pour half of the vinegar mixture (made with sushi vinegar and rice vinegar) over the rice. Then finally, scatter the toppings of your choice over the rice, and pour the remainder of the vinegar mixture. Your chirashizushi is now ready. 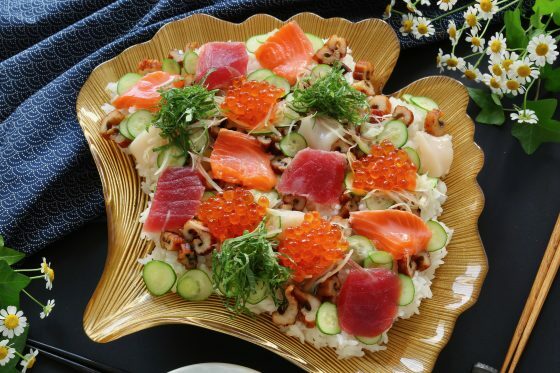 As an aside, Ms. Kobayashi most recommended toppings are: tuna sashimi, scallop sashimi, salt-water eel, salmon roe, boiled shrimp, tinned crab, tinned tuna, shredded perilla leaves, shredded myoga ginger, thin cucumber slices, red pickled ginger, and lemon wedges. Make sure to scatter plenty of toppings over the rice. 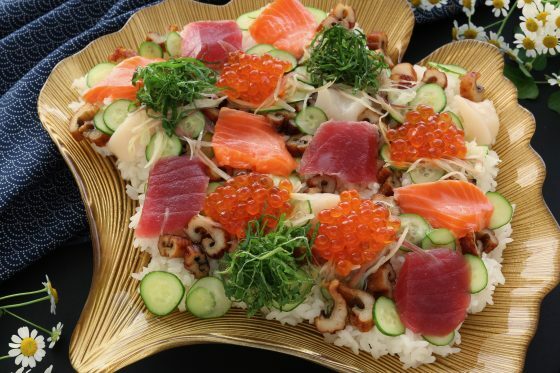 The vinegared rice features a very mild flavor, so having some slightly saltier toppings here and there, like salmon roe and red pickled ginger, or slightly more rich-flavored toppings, such as salt-water eel, really gives this dish a great depth of fulfilling flavors. Vinegared rice is generally made by mixing rice with a vinegar mixture. 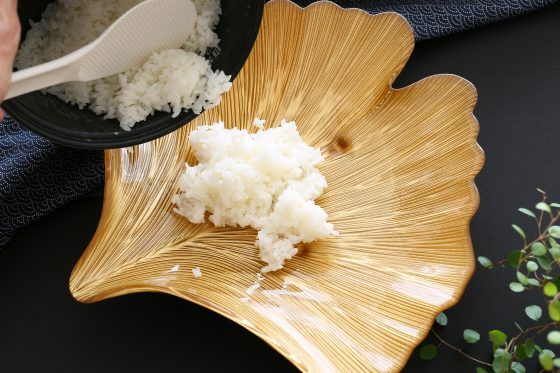 However, this vinegared rice is made simply by pouring the vinegar mixture over the rice. Vinegared rice that is made by pouring the vinegar mixture over rice tends to be less boring, as each mouthful is likely to taste slightly different. This vinegared rice offers uneven flavors throughout, which is precisely what makes it so delicious. The flavor of the rice is really mild, making it perfect also for children. A splendid and beautifully-colored chirashizushi is ready in no time! By the way, you can still make this chirashizushi recipe even if you cannot find any sushi vinegar sold commercially. 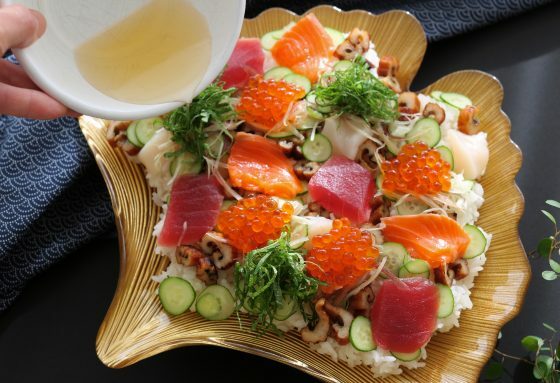 If you do not have any sushi vinegar, you can use the recipe below to make the vinegar mixture in the recipe above. Also, if you cannot get hold of any konbu kelp for the recipe below, you can just mix 4 tbsp of vinegar (instead of 4 ½), with some salt and sugar, to create a similar flavor. Mix all the ingredients and leave them for two hours to let the flavor of the konbu kelp diffuse through the mixture. Take out the konbu kelp. Your vinegar mixture is now ready. You can now use this vinegar mixture as a substitute in the original recipe.